Let’s face it – Singaporeans are suckers for Hello Kitty. Whether it is a toy at McDonald’s, a pair of shoes from PUMA or a Baby-G watch from Casio, people go crazy over anything associated with the Japanese cartoon character. This May, Furla is bridging East and West with a Hello Kitty Capsule Collection which takes inspiration from the blooming landscapes of Italy. From crossbody bags to purses and keyrings, the collection comes in luxurious textured leather and classic Hello Kitty colours – red, pink and a dark blue to balance out the lighter colours. Pair your casual outfits with these crossbody bags. They’re the perfect size to hold all your essentials (handphone, wallet, keys, etc) while remaining cute and compact. The bright colours call attention to the bag but it will never overwhelm your outfit because of its size. Whether you want it to be a statement piece or an adorable and convenient accessory, the crossbody bags will cater to all your fashion needs. Your cards, cash and coins will be kept safely with the Japanese cartoon character with these adorable collection pieces. Our favourite is the Kitty Coin Case Bear that comes with a gold chain so that we can clip it onto our bag strap so it won’t get lost in our bags. We don’t know about you but we’re guilty of throwing our lipsticks and compacts into our bags for on-the-go touch ups, which result in them getting lost or dirtying the rest of the stuff in our bags. 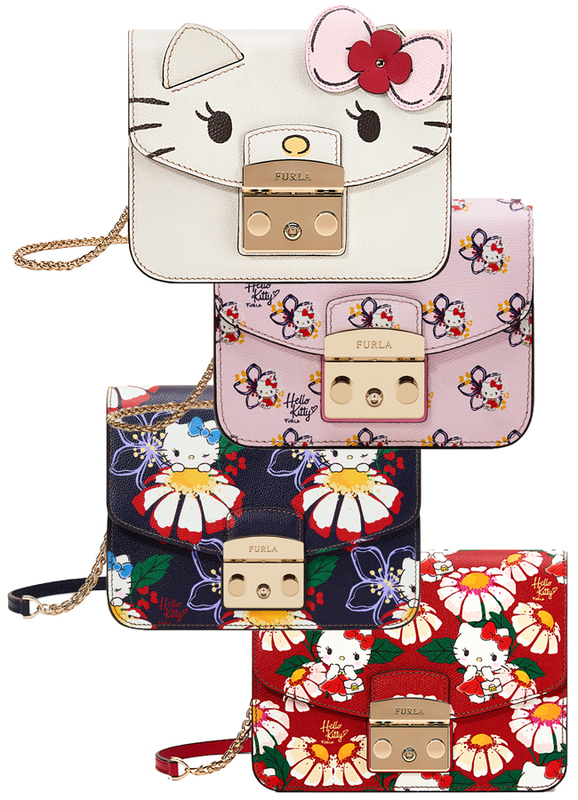 Well, that’s just another reason for us to get these cosmetic cases from Furla’s Hello Kitty Capsule Collection. You can also put other things like receipts, perfume or snacks to keep your bag more organised. The collection also includes key rings that come with gold hardware for a luxurious finish. We know you’re dying to know when you can get your hands on these. Well, you’ll be delighted to know that the whole collection will be available in local Furla stores today! Count ourselves lucky because there are only a handful of countries that can get their hands on it today, while the rest have to wait until 15 May.